The Special Olympics is proud to announce an incredible roster of celebrities and football legends who will participate alongside 16 Special Olympics athletes in the inaugural match of the “Special Olympics Unity Cup” presented by Coca-Cola, at Cape Town Stadium just prior to a 2010 FIFA World Cup quarterfinal match on 3 July. Earlier this week, key members of the Unity Cup presented by Coca-Cola joined for a photo opportunity, as part of Special Olympics Global Congress that is currently being held in Marrakech, to celebrate this roster of celebrities and global football legends. Those members included executives Timothy P. Shriver, Special Olympics Chairman & CEO and Muhtar Kent, Chairman Chief Executive Officer, The Coca-Cola Company and SpeciaI Olympics International board member; as well as Unity Cup participants Ben Haack, Special Olympics’ Australia athlete and Clarence Seedorf, global footballer of AC Milan. 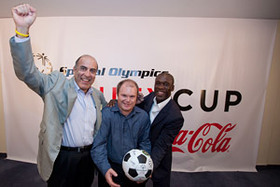 From left to right: Muhtar Kent, Chairman Chief Executive Officer, The Coca-Cola Company and SpeciaI Olympics International board member; and Unity Cup participants Ben Haack, Special Olympics’ Australia athlete (center) and Clarence Seedorf, global footballer of AC Milan (right). Photo credit: Diego Azubel. The Special Olympics Unity Cup presented by Coca-Cola will be a 20-minute match held at 2:00 p.m. local time on 3 July, where these football legends and celebrities will take the field alongside Special Olympics athletes in an extension of the Special Olympics Unified Sports Program, which brings Special Olympics athletes together with partners without intellectual disabilities on teams for friendly athletic competition. The match will foster the message of inclusion and acceptance for people with intellectual disabilities. Since the establishment of Special Olympics in 1968, The Coca-Cola Company has been an Official Global Partner. Coca-Cola supports the movement in an effort to showcase the dignity and capacity of people with intellectual disabilities on a global stage. For more information about the Unity Cup, please visit: www.specialolympics.org/unitycup.